contract extension for physical depth defenceman Kevan Miller. add that element smartly, thanks to some judicious bargain-bin shopping. had Gryba been healthy and the Oilers interested in moving him. giving up significant assets or overpaying in dollars. The #Oilers have acquired Patrick Maroon from the @AnaheimDucks in exchange for Martin Gernat plus a 2016 fourth-round draft pick. the penalty kill in addition to his even-strength duties. I like UFA Eric Gryba but if he’s looking for four years at $10 million like Kevan Miller I don’t think he’s getting it out of the Oilers. going down that path requires leaving Edmonton. Is there a trade fit between the Oilers and Sabres? Big players who can grow a playoff beard for 82 games a season are worth a premium. I love Gryba but he’s a #7 D man who’s not worth anymore than 1.5M for 1 or 2 years. Even then, I’d really only give him 1 X 1. And sign FA RW heavy right handed Chris Stewart . Both guys who can play hard and move up and down the line-ups adding secondary scoring touch and tenacity, Adding them with the 3 you mentioned We would be Solid! That’s a pretty good first year at the helm. He has roster space and a bit of cap wiggle room even with rookie bonus money being spent like allowance on Saturday. Year two starts with this draft and July could be a hot summer. Some like it hot. I like Gryba but $2.5 would be nutso. As resident old timer, Lowetide, would say – we wait. I’d sign Gryba to 2yrs at 1.75MM per. That’s a healthy raise of $500k per year. He’s the perfect 7th d-man for the Oilers. Tough, gritty, and a RH shot to boot. If he wants more than than 1.75MM, I’d look elsewhere. Ben Lovejoy would be a good 6/7 RHD which could probably be had for around 1.5MM per. He made 1.2MM this year with Pittsburgh. He’s 32 and has good size at 6’2″ 205lbs. I’m sure his agent is telling him to go to free agency, why wouldn’t he, a premium is going to be paid for right shot dmen this year, everybody wants one, it’s the in thing now. Not the Sabres, Jets or Hurricanes ..
Would the Oilers be interested with a first round swap with Flames if they offered Hunter Smith and a second or 4th round pick ? Given that Edmonton already has a big forward drafted way too early who can’t score in the AHL, I’m going to say no. How about a Ferland , Colboune or Bouma with a late second ? If the Oilers trade down it will likely be in the 7-10 range where the can get a dman and an asset. Columbus needs a C badly, swap picks give them Musil and get Savard in return as 2nd pair RD with some offence, huge and 2nd unit PP. The draft one of the 3 top dmen. That is the tyoe of deal PC will be interested in making, not AHL players or fringe players. With Dubinski , Jenner and 3 other young centers like Wennberg and Karlsson , Columbus not exactly hurting at the center position . Why would they even consider Musil on their defence . Just like you say , why would other team want our AHL or fringe players in a trade ? The truth is that is probably all the other teams might offer us to move up or down . I would not expect to hit a homerun unless they (Oilers) drop back into top 12 or above in draft , where someone might extend themselves . The 4-9 group is pretty much par with one another . If P.C. wants to add more size, I still believe in Matt Martin. He has very nice hands (not just for fighting), his speed/quickness is deceptive for his size. A 2 year deal @ 1.75 Million per would be a bargain for this brute. I read on some random blog that Chris Stewart’s likely price is around $1.5 million per season. If that’s the case I’d sign him for 2 years and put McDavid in between Stewart and Maroon. Just get the kid the puck! BRAINSTORMING : Here is a list we might be able to trade with and get a homerun . Give us your ideas of whom we might target in personnel from theses clubs . These teams have no first round pick : NBR.20 NY RANGERS , #21 -L.A. KINGS ,#22-Chicago , #28-SAN JOSE , #29 PITTSBURG – HAVE NONE THIS YEAR OR NEXT , AS WELL AS NO SECOND THIS YEAR . What might those team hand over to obtain the NBR.4 pick as compared to those already in top 12 ? None of these teams will trade us what we would want for the 4th pick which is a top pairing D-Man. What we want is a significant upgrade anywhere there is a weakness , but a defenseman would be nice if available . There has been some big names dealt and acquired over last 11 years . Names like Pronger , Pacioretti , Couture , Carter , R.Smyth , Thomas Vanek , etc.. Since 2005 the list of most active in this regard are : Anaheim (Trade 8 Acquired 8), San Jose and St.Louis (7 and 6 ), L.A.Kings and Islanders ( 6 and 6 ). You’ll notice the active ones are generally the better clubs . not the low tier clubs . I doubt , and hope ,that Chia has not limited his search to move our pick to only include options for defence only . We also need another quality goalie and probably a RWinger to replace Yak by the sounds of it . The return would have to be significant seeing as Tkachuk could be quite the find in itself . While I agree with you that some big names have been moved, I would say that we need to look at only the last 5 seasons. The landscape and the way business is done in the NHL has changed since Chris Pronger was traded to and from us. Couture was never traded and neither was Pacioretty lol. Smyth and Vanek were traded in contract years, while Carter had many reasons for why he was dealt twice but that is the only player you mentioned who was actually traded without being in a contract year. Other names like Rick Nash and Gabby have been moved however. But, the only way the Oilers should be trading pick #4 for any forward is if they want to replace Nuge or Ebs (who they would trade for a D-Man in that case). If they plan to keep all the forwards (big mistake) and look to trade the pick to replace Yakupov, that is a huge huge mistake. The team needs D not more forwards. If you look under 10 most regrettable NHL trade deadline deals – San Jose traded their first pick away to Montreal which ended up being Pacioretty . They also traded away their other one same year (2007) to St.Louis that ended up being D.Perron . He followed that up the next year bringing in B.Campbell for what turned out to be T.Ennis . Here is the crazy Montreal deal that was so bad . To Montreal – first pick (Pacioretty) and Josh Georges for Craig Rivet and some unknown . He then traded for Guerin and cost him D.Perron . Unfortuneately , both his acquisitions were pending free agents . I believe Couture was a similar type acquisition , but cannot locate where I found it earlier . Makes you wonder if we should be making a deal like Montreal got from Wilson . Yes but those picks were all traded before the player was selected. The respective teams found the players with the pick. Montreal did make some horrible deals though, like trading McDonagh for Scott Gomez. The pick we used on Eberle was received in a deal (Pronger Trade) as well as the Klefbom pick (Penner Trade). Right now we should not be looking at making deals to acquire future picks and potential future players. We need to improve today. That’s why it is so important to turn one of Eberle or Nuge into a top pairing D-Man. Moving Schultz and Purcell out at the deadline and bringing in Maroon and Kassian has the Oilers close to the top 10 in the league in size. If Yak and Ference go out the door, that will make make them bigger as well. The only players that would be considered small on the Oilers next season are Eberle and RnH, otherwise it’s a pretty meaty roster. Below is what the roster looked like at in October of last season in respect to size. The Oilers team last year were bigger than the last 2 Bruins teams that PC managed. The Oilers are no longer a small team, and some of the kids are going to get bigger. #4 overall to Arizona for connor murphy and #20 pick acquired from rangers. He’s not a top pairing but definitely a top 4, might be expendable with the emergence of stone. Oil might need to add a pick or prospect to make it work. To add to what I said above, apparently there are rumors that Nash is available. While he has a high cap hit of $7.8M and is coming off of a bad season, he only has 2 years left on contract (before McDavid Extension would kick in) and did score 40+ goals season before this one. I would assume that due to contract and career worst year, the ask would be low. Maybe Yakupov and Pick #32 could get a deal done, seeing how Rangers want cap room and more prospects. Nash can play either wing and would be a huge upgrade on Yak in every aspect of the game. He would also make Nuge or Eberle expendable in a trade for a D-Man and if he plays well then that is better for us and even if he only hits 20 goals 40 points next 2 seasons, his contract will be off the books. Low Risk, High Reward kind of move that PC should be looking for. Why stop there if your wanting to deal Hopkins or Eberle for a defenseman ? Use them or possibly even add or subtract to that with an Oesterle , Davidson , Reinhart or possibly even Nurse , and see what Rangers would give us for one of their better defenseman , such as R. McDonaugh . Yes, most definitely can make a package to acquire a top notch D but I think a player like Faulk is in the same category as Ryan M from Rangers but at a lower price. The cost for him would same or a bit less than Pietro and at that point you may as well go for Pietro. The top 2 slots for left D are already taken by Klef and Sekera. The right slot is what the oilers desperately need. McDonaugh would give us a top 1 defenseman , and with our overload of up and coming other left defenseman we should have plenty to procur a decent r . offensive defenseman if we so choose – be it by trade or otherwise .. Thus we could end up with two crucial upgrades to our defense . Basically , trying to keep it more of a one stop shopping trip if possible . Lots of options to explore in quest to get better , and the best option may well be a blockbuster multi player deal . Yes McD is for sure a top d-man. But then who do we trade for a right shot? Sekera has a NMC. Klef looks like he will develop into a Stud (as long as injuries dont ruin him) on a great contract. That right there are your top two left shots. Unless you think we can convince Sekera to waive his NMC and acquire a player like Faulk or Barrie for him? Vancouver just got one of my picks for R defenseman . They traded J.McCann for E.Gudbranson . Heck of a deal we missed out on . Van over paid big time. 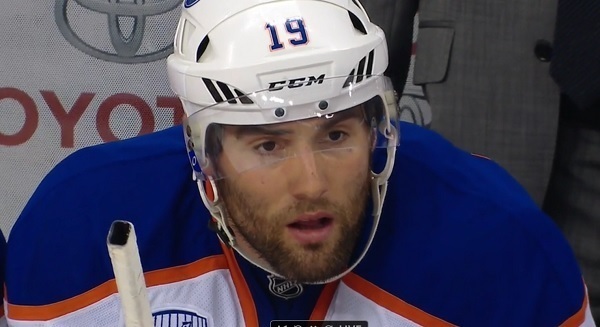 Gudbranson is basically a younger gryba. Look up the stats. This is almost as bad a deal as the Reinhart one. Maybe PC can trade yak and reinhart to benning for the 5th overall pick. Come on McRae , you don’t really believe that do you ? Have you seen all three play ? Big difference in Gudbranson compared to our boys . He physically manhandled our boys last game against us . He is good and your going to find that out when Vancouver now plays us . You’ll eat your words on that one . I go more so by analytics then I do “eye-test”. Yes he is big and physical but Florida did better as a team with him off the ice. His analytics and stats compare him with Gryba. His skating is suspect at best as well. McCann was van’s top prospect, a player who made the team at the age of 19. Florida also received a high second round pick, as of today it looks like an over payment and fans and many analysts seem to agree. Even Canucks fans hate the deal. And a lot of players get physically manhandled. Great trade for Florida, just like it was a great trade for the Islanders. Shows how poorly those analytics are out of wack /sync when you compare a stud like Gudbranson to Gryba now does it not . Vancouver got a great deal and certainly time will show that seeing as they got much the better player to begin with . Florida let him go as they felt they could not get him the price he wanted for long term . One year was just a bridge to try and hold him. It’ll cost Canucks more than the 3.5M to keep him after next year . Next time use your eyesight and you’ll see the difference plain as day – you don’t need analytics to cloud the issue and give you a flimsy or false prediction . To bad we didn’t get him – was one I was pushing for . Vanc. best youth is Horvat and Virtanen who also were drafted much earlier than McCann (24th I believe) . They’ll also get a better one than McCann this year in Tkachuk , Dubois or a another top defenseman. As Kypreos put it -there are just not that many top defensive R studs around that are top 4 on any club . I’m sorry madjam but when you have been spending all this time trying to discount a player like Faulk and then go and call Gudbranson a stud, you lose all credibility. The eye-test also says that Korpi plays on the PK therefore he is a good defensive forward lol. This deal vs prototypical old school (Draft position, size, leadership) vs new school (analytics, skill) and hence the support is the same. I don’t discount Faulk , just what you would pay for him . You should have figured that out by now . I doubt we would get him anyways and thus might be better looking elsewhere . You are correct, I should have put into my wording that you discount him due to what you not willing to pay for him (Nuge or Eberle). Yeah I agree with you that we are likely not to get him, but Gudbranson is far far from a stud. He would be good on our third pairing, maybe second pairing with a strong puck moving partner but should be no where near a top pairing. Gudbranson is a 6-7 D-man and his stats do back that up, so what if he can fight! He sure as hell cant play in the top four let alone the top two. Since the Oilers HAVE top four D-man, it doesn’t really matter how many others out there get traded, the Oilers need TWO top pairing D-men and nothing else really matters certainly not another 4-5-6-7 D-man. Oh, and the reason Gudbranson played so much against the Oilers that ONE game is because the Oilers knocked Ekblad out of the game. I am as high on Gudbranson as Kypreos and the Sportsnet group that say he is a top 4 stud defenseman , and whom I would take over your poor assessment to begin with . He’ll be playing top 4 for Vanc., just like he would be here if we had got him . Madjam, if someone plays Top 4 does that make them a Top 4 D-Man? Justin Schultz was playing #1 or Top Pairing minutes but that didn’t make him a top pairing D, did it? Kypreos is an old school guy, he values size, physical play, etc more so then any stats or analytics. Stats and analytics don’t lie, the panthers did better with him off the ice then they did with him on it. All of his partners did better away from him then with him as did the forwards. What we need is 2 RHD that can legitimately play top 4, with one of them being able to run the PP. Gudbranson doesn’t fit that profile. At best he’s a third pairing dman and needs a puck-moving dman beside him. Gudbranson was barely adequate in Florida with Campbell beside him, with other partners his fancy stats were well below average.